We love traveling, exploring the length and breadth of India in our little silver Wagon-R (this little buggie just completed 1 Lakh kilometers on our recent trip). Before my son was born, my husband S and I had chalked-up quite a list of places – about 52 little towns, forests and mountain tops. But all of that came to an abrupt end after our naughty munchkin with the face of an innocent monk and the mischief of a goblin, appeared in our lives. We just didn’t have the gumption to pack all that baby gear or deal with oodles of fussiness that was the USP of my son, till recently. Add to that S’s postings and assignments that left us with meager holidays, most of them at last minute notice with the Damocles Sword of being called back from leave hanging on our heads. But this year, as 2018 rolled in all bright and dazzling, we decided to pack in a few places we’d been craving to visit. And with holiday destinations a drive away from Delhi, this seemed too good an opportunity to pass up. Holidaying in a Haveli: Our first stop during our February holiday was a quaint heritage haveli in Alwar. Burja Haveli, which is three hours from Delhi, is just the place for spending a quiet little holiday in. A 240-year-old manor that once upon a time belonged to a prosperous Jagirdar, it’s still run by the descendants and offers a medley of comfort, old world charm and a taste of rural Rajasthan. With rooms set around a courtyard that also doubles up as an outdoor restaurant, Burja Haveli is ideal for unwinding, soaking in the slow pace of this small town or curling up with a good book. Hello friends - faujis, fellow fauji wives & non-faujis! Welcome to 'The Brigade That Builds Brands'. It's all about fauji wives / military spouses, who make work work for them through multiple postings, back-to-back social commitments, spotty internet connections, long stints of single parenting, community mindset regarding how military spouses should or should not work and a lot more. Meet Prabhjot Kour Dhillon, a Paper Craft Artist, former AF pilot and fellow Air Force wife. 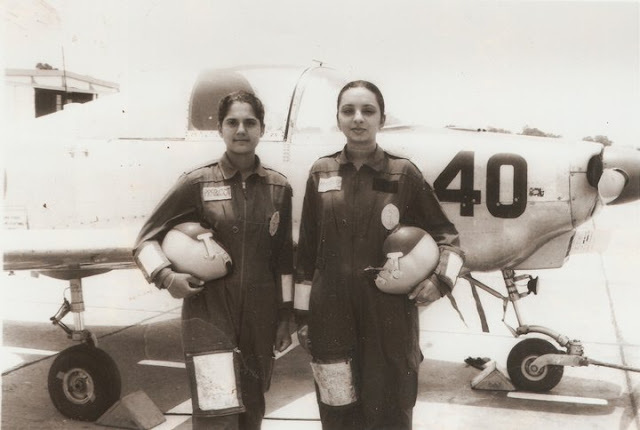 When I sent out the message for interview requests for this series (The Brigade That Builds Bands) and connected with Prabhjot for the first time, it turned out that she was my husband's course mate from the Air Force Academy. A happy coincidence that re-asserts the fact that this world of ours is truly a small and cozy one. 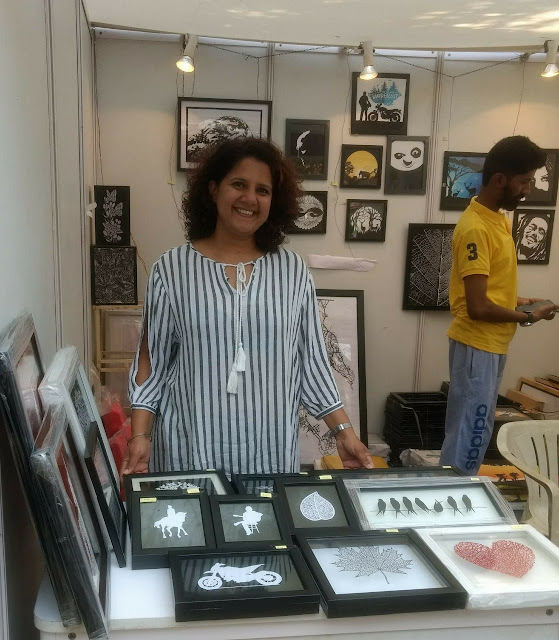 Let's get on with our chat as Prabhjot and I 'talk' about how she re-ignited her creativity after leaving the Air Force, turning her art into a creative venture. I do hope many of you will be inspired to do the same and create your own craft-based brands while juggling the many commitments of the service life. P. Hi, I am Prabhjot Kour Dhillon, married to Gp Capt Anurag Khurana since 2003 and currently based in Jamnagar. I am a creative entrepreneur. 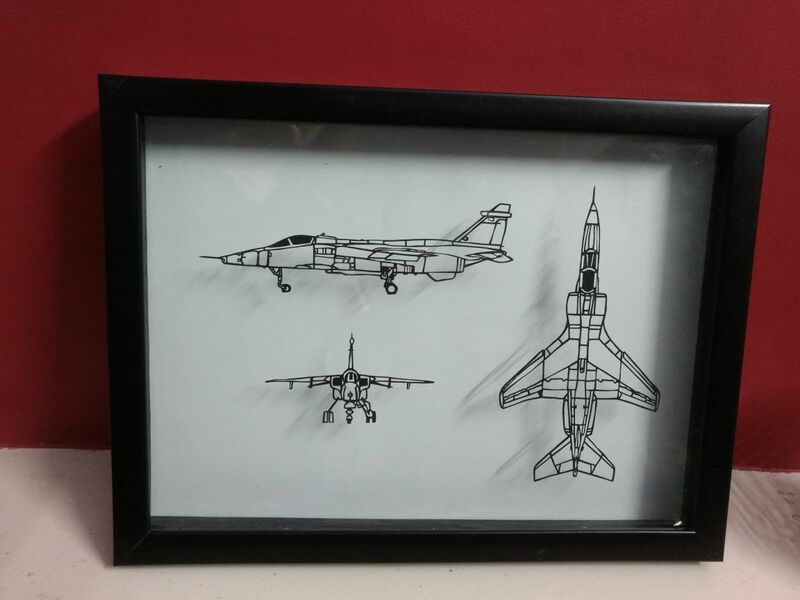 I am into intricate cutting of paper works, mostly defence related themes like aircrafts, carriers, submarines, insignias as well as other things. Along with this, I also do paper craft, hand embroidery, bottle texturing, tatting and upcycling of folders. I have also taken workshop for ladies and children in basic and advanced paper craft, and stencils. I have put up my work at the AFWWA shop. I also take online orders, my work displayed on my Facebook page HandKraftd. Recently I had also put up my work at Kala Ghoda Art Festival, in Mumbai, along with another paper artist. P. I have always been into creative arts since my teen years. Lost touch when I was serving in the IAF as a Pilot. I restarted my hobbies after I left service and only recently commercialized my work since Oct, 2017. P. The resources for my kind of work are available everywhere. Thankfully I have been based at places which were well equipped, so never had that problem. 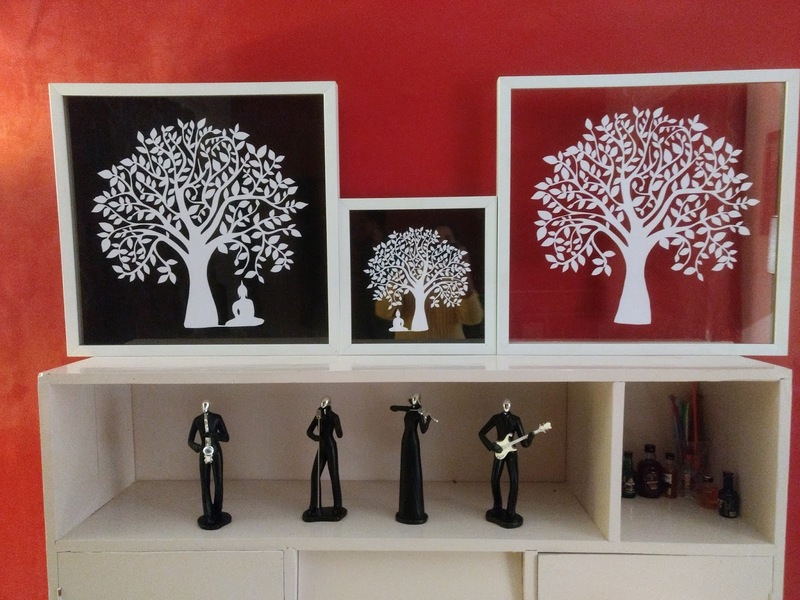 Things like finding a good framing shop was a hassle here in Jamnagar. The best I could find was in Rajkot which is around 100km. But since I can drive and am independent, I just drive to Rajkot and get my work done. P. Hobbies are about spending your leisure time in something you love to do. If it makes money as well..I guess that’s the perfect job satisfaction. And, taking time out for something is all about priorities and time management, which with so many years of experience we have all learnt to manage. P. I have a page on Facebook named HandKraftd which showcases all my work and I take the orders online. So even if I move to different bases, the work does not suffer as I can courier my parcels. Otherwise , there's always the AFWWA shop to keep my products. 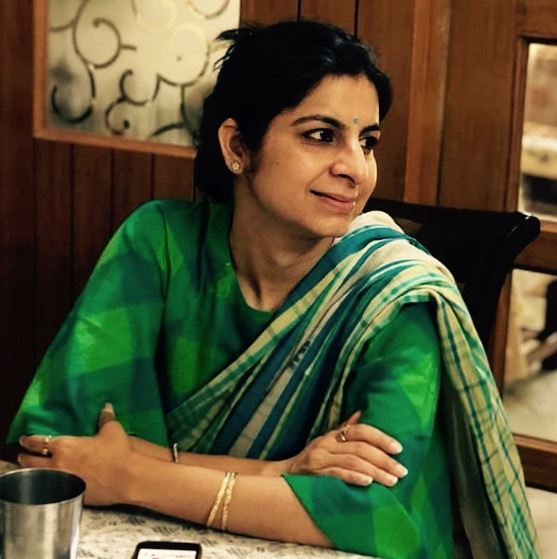 P. As an Entrepreneur and a Fauji wife, I love the belonging and connection we have to where we are. Nobody is trying to put you down. The change is coming, and it can be felt in every aspect, in the sense that now women want to be independent. This was not the way earlier. They were content with their situation. This I feel is the first big step for everyone. P. In fauj we are like 'Koop Mandook'. It's the frog in a well who doesn’t know about the world outside. It's the same for us. A lot is happening in the world. Even though we live in the age of internet, we lack the exposure to various art festivals, exhibitions and so on. P. It's all about priorities. Where there's a will, there's a way. With work going online, there’s a huge door open to all. There might be few difficulties, but not so much that we can't find a way through it. And, we are genetically built to multi-task, so we know how to juggle work and home. P. Hobbies are therapeutic. And if they pay you as well, what more can we ask for. We just need to prioritize things in our life and decide what’s more important to us. C. Thank you for joining me at my blog! 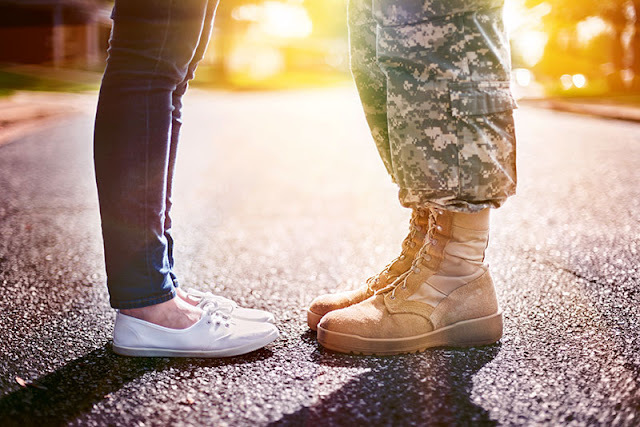 Hey reader, would you like to read more military spouse/fauji wife interviews and stories? Here's the entire section. And while you've still got your read-a-roo cap on, hop over to our Women's Wellness & Green Living e-Magazine - Gorgeous Girls Go Green, for a clutch of interesting articles. Summer’s in its element. If she was a lady, she’d be reigning the season in her marmalade and gold sari, her auburn hair swirling around her head in wild curls. Summer has fire in her belly and the sun in her heart. She rules with a fierce passion, weaving lava-hot sun beams into the dry landscape and trailing velvety ribbons of heat wherever she goes. But as Summer dances her wild dance, we on Mother Earth resort to everything cool and calm to seek balance in our lives. Chilled beverages, ice-cold luscious fruits, and gossamer fabrics. Summer saris in crisp cottons, gauzy lace and breathable weaves are the perfect go-to-garments for our hot tropical climate. 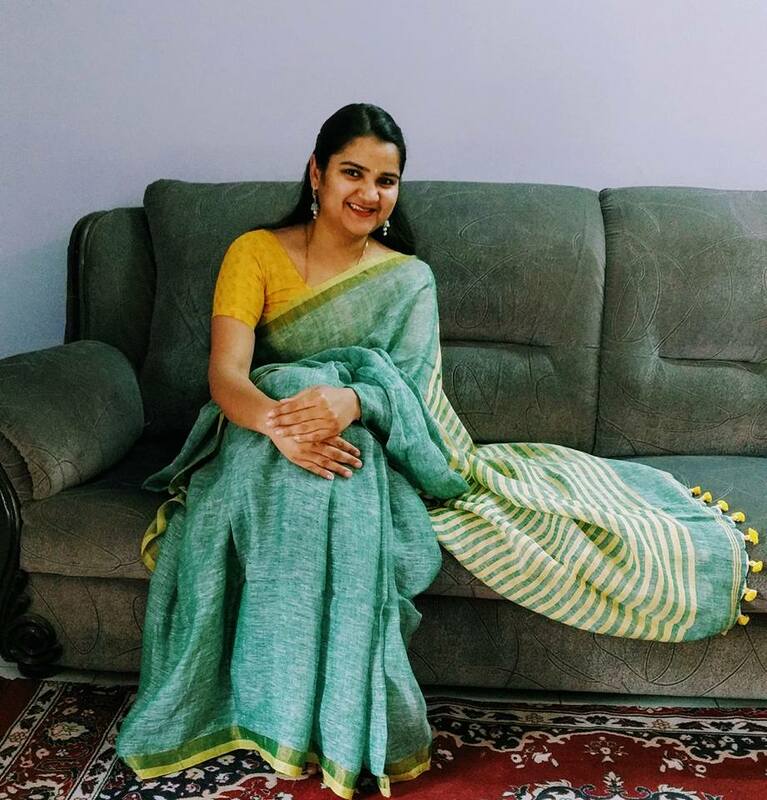 For this feature, I’m sharing a few of my own favorite summer weaves as well as showcasing what some of my sari sisters from across the country enjoy draping as the season notches up the heat. Get ready for a profusion of gorgeous summer saris that are lovingly worn by equally gorgeous women. I got married to a man in blue 12 years ago, and even though I spent my growing up years in the defense services (we're called "fauji brats"), there’s a lot I didn’t know about the "other side of the fence". 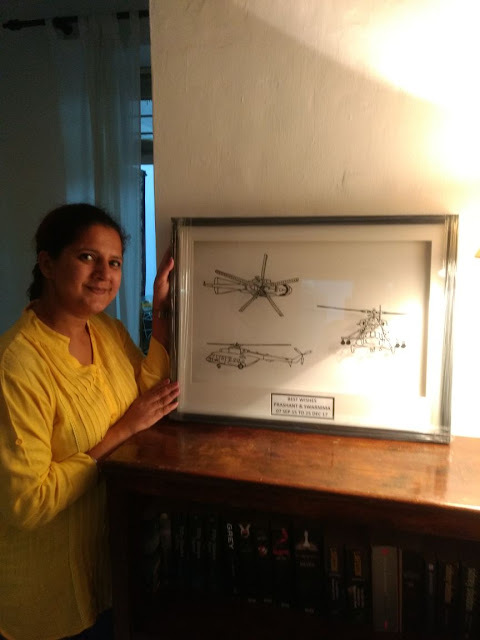 When I moved to a station in the boondocks (complete with fields of sarson and battalions of buffaloes), I truly understood how different it was as a service kid and a fauji wife/military spouse. 1. You’ll get a ‘welcome do’ that you’ll never forget. In my case, I was already familiar with the famous welcomes that new brides get, so when I was asked to turn up for a party in my pajama suit (they said it was a pajama party), I gave everybody a surprise by landing up in a silk sari. But if you’re lucky, your welcome will always be a memorable part of your time in the services. 2. 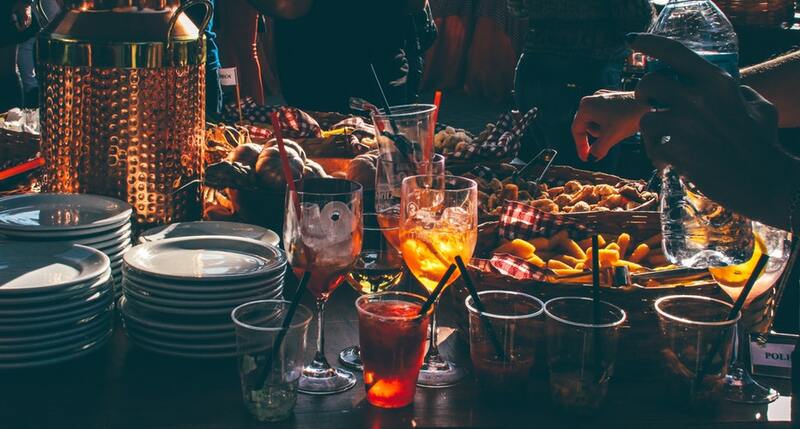 Picking up a plate at a party will never be the simple act that it always was. When dinner is announced at a party, the senior most lady (who is the wife of the senior most officer in the unit, generally the Commanding Officer’s wife) must pick up her plate before the next lady in the seniority chain picks up hers and so on. I remember goofing this up several times as a new wife and then being ‘counseled’ for it too (I’m very slow on the uptake when it comes to protocol and hierarchy). 3. You’ll get plenty of occasions to dress up like a queen. In fact, you can turn into a fashion diva, if you so wish. Whether you’re wearing a heavy sari for a formal party or a dress for a theme party, or salwar-kameez or crisp cotton for a welfare meet, there are plenty of occasions to dress up for. Hello everyone! Welcome to 'The Brigade that Builds Brands'. It's all about fauji wives / military spouses, who make work work for them through multiple postings, back-to-back social commitments, spotty internet connections, long stints of single parenting, community mindset regarding how military spouses should or should not work and a lot more. 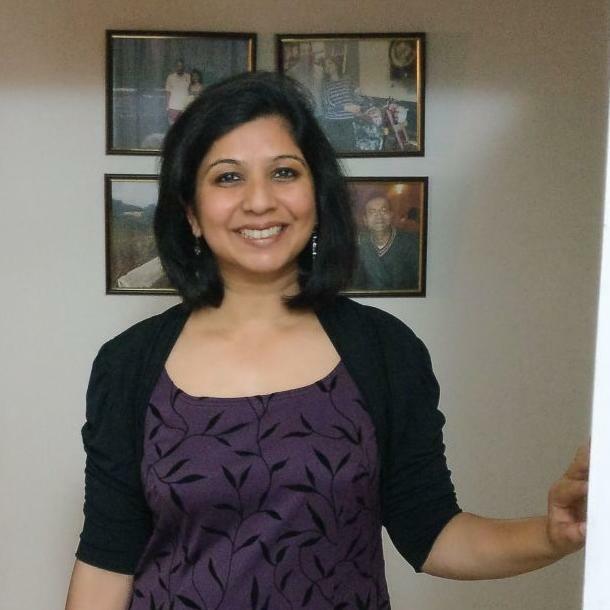 Meet Payal Mittal Talwar, a Life Coach, Trainer, Co-founder of WINGS Team and Army wife. I was introduced toPayal a year ago, when I was looking for ladies to interview for my article about Military Spouse Entrepreneurs. 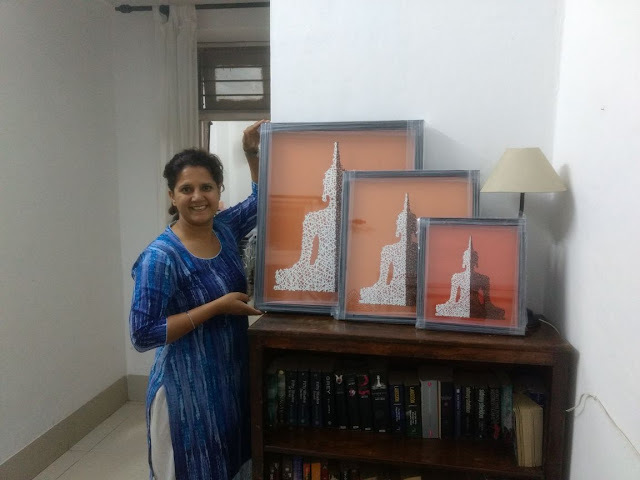 Since then, we've followed each other's journey and Payal has been especially supportive of my sojourn as a Green Wellness Educator & Entrepreneur. Here's our chat about what it takes to build a sumptuous work portfolio, while also living and working at back-of-beyond bases. 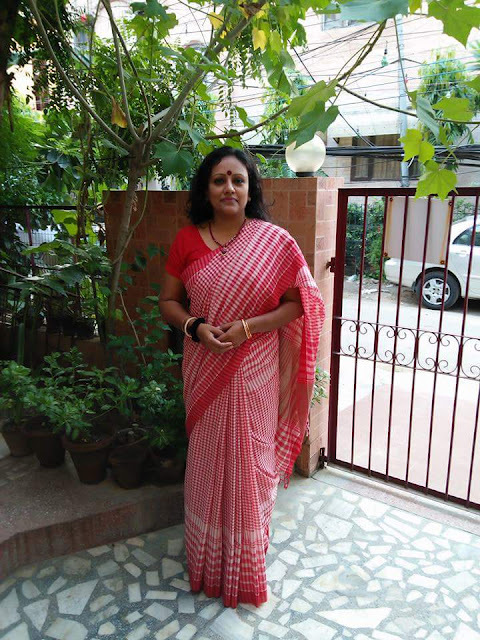 P. I’ve been married for over 22 years – a fauji to boot as I’m also a fauji daughter and a fauji daughter in law. I co-founded a company, WINGS team, with my best friend- Priyanka Renjen Kumar(a fauji wife herself). We are into Life Coaching, training and facilitation, and content development (social media as well as academic). My husband is a fighter pilot. Hmm…now did I hear some oohs and aahs?! Because I always do whenever I mention this fact. With Tom Cruise aka Maverick having done a splendid job at creating this larger-than-life and smart-alecy image of fighter pilots, just the mention of this profession has people conjuring up Top Gun scenarios. 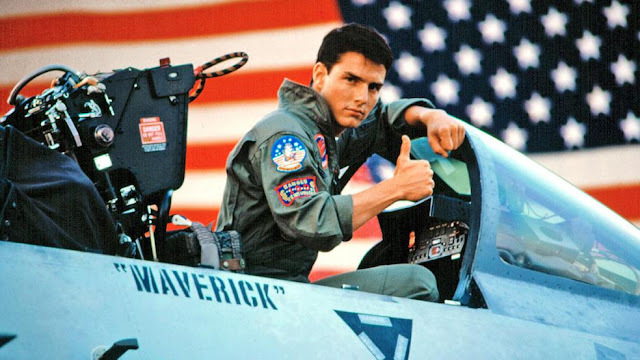 So, are fighter pilots like Tom Cruise in Top Gun? Do they wear their Aviator sunglasses all the time? Are they just as cheeky? Well, read on to find out. I’ve been married to S aka Smokey Bandit for 12+ years now. I’ve also met and interacted with lots of other fighter pilots – his buddies, squadron mates, course mates and our friends. And this is what I have to say about the images and avatars that are attached to fighter pilots. 1. 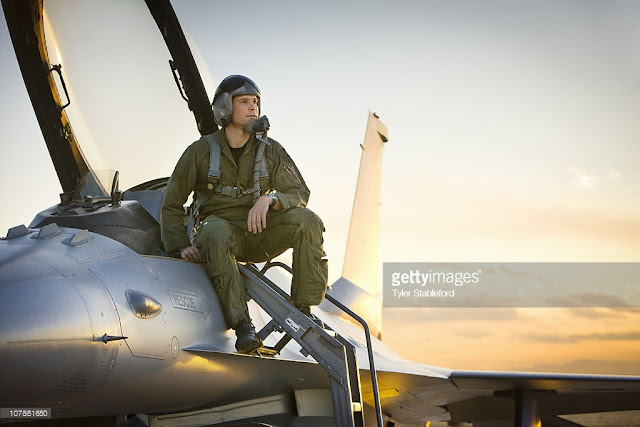 The image: Fighter pilots have a larger-than-life persona. Truth: These are guys with larger-than-life jobs, but down-to-earth personalities. Though not all of them are humble (c'mon we've all met a few stuffy ones, haven't we? ), most of them are pretty easy-going.